I don't know how did I manage to go over a year of blogging without a recipe for Tabbouleh. After Hummus and the inaccurately named Baba Ghanoush, Tabbouleh is The Levant's third biggest culinary export to the world. Like all other dishes that moved from local to international status, the tangy parsley-based salad has been bastardised and adapted in endless ways. My friend Tammam has had a "tabbouleh" dish from a supermarket in Geneva withe the ingredients: couscous, raisins, onion, chicken and basil! Admittedly, not all adapted version are as bad. 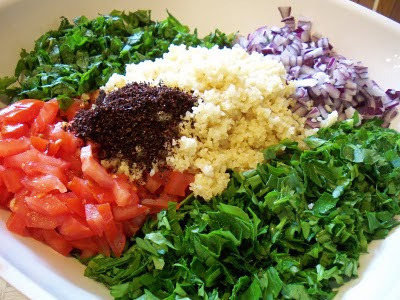 In most cases of "supermarket tabbouleh" the main ingredients of the original dish are the same but the balance is completely skewed towards Bulgar. Authentic Tabbouleh should be three quarters parsley and one quarter everything else. In my recipe I tried to use as accurate quantities as I could, so any body trying the recipe can get a taste and feel of what an authentic tabbouleh is. To give tabbouleh its characteristic spicy edge I like to use finely ground black pepper. You can use allspice, mixed spice (baharat) or as they do in Aleppo, Aleppo peppers! In my recipe I use fine Bulgur wheat which you need to buy from Middle Eastern shops. The grain is very small so you don't need to cook it. Just soak in water for 30 minutes will do. However Bulgur bought from high street supermarket has medium size grain and will not be soft enough just soaked. You will need to boil it for 10 minutes then drain and let cool. Start by washing and soaking the Bulgar wheat in cold water for 30 minutes. The secret to nice crisp tabbouleh is a very sharp knife to chop the parsley without bruising the leafs. Chop the parsley, mint, onion and tomato finely. Drain the Bulgar and squeeze the extra water. Squeeze the lemons. Mix all the ingredients. And leave for around 30 minutes before serving. We like to serve tabbouleh with lettuce in Syria. We use lettuce leaves to make small wraps full of the tangy salad. A lovely post on a beautiful salad. I love learning from the informations you give. The garden is full of parsley and I have the last of some homegrown tomatoes, so guess what salad we will be having tonight! I can imagine why it took you so long to post this recipe. Probably it's because it wasn't easy. This is a salad that hugely depends on fine tuning and tasting while in the making. You just have to know how Tabbouleh should taste and look like. That could make it difficult to come up with accurate measures. But I'm happy you finally did as I feel offended when I see a carton box on a supermarket shelve with Tabbouleh on it!!! I just have one remark, unless unavailable, I prefer to use green onion in Tabbouleh. For some reason or another, my family's recipe calls for finely chopped romaine lettuce as well. Nothing better than home grown salad! I get so affended as well! I should have mentioned spring onions alternative in my post. Thank you for reminding me. I actually prefer it with red onions but I know many people who prefer it with spring onion. Interesting, I havn't seen tabouleh with lettuce before. My mum occasionally add very finely chopped cucumber, but I am not too keen on that. 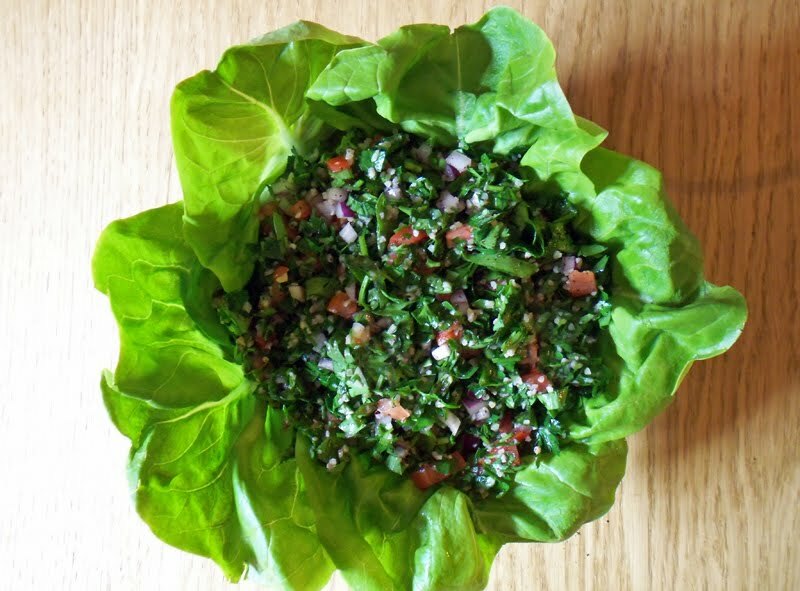 I am so glad you posted this; more people should be aware of what a real tabbouleh is as opposed to the fake one! What irks me is the one made with couscous. i love your tabbouleh recipe very nice. Don't get me started on couscous tabbouleh. It gets me every time! Welcome to my blog. I am gald you like the recipe and I hope you will be a regual visitor. Right, I'm trying this at the weekend. I remember eating this in Jordan but I never thought of making it until now. Welcome to my Blog! I hope you try Tabouleh (or even tried it already) and you like it. I took a quick look at your blog. Looks really great. I need to go through properly and try some recipes. You now need to add some Eastern Mediterranean recipes. I like the addition to Sumac. My Syrian-Jordanian mother doesn't add in Sumac or red onions but she does include cucumber, green onions and finely chopped Romaine Lettuce. I really like your blog!!! Welcome to my blog! I am glad you like it. Recipes vary a lot from family to family. I think most people use green onion instead of red onions. you are a genius! thank you for this fresh natural balance of flavours. your generosity in passing this on to others is greatly appreciated. Thank you very much for the nice words. I am really glad you liked the recipe. I like the idea of soaking Burghul in lemon juice. I will try this next time. I'll tell you what and how just incase you'd like to try it..because the ingredients are the best way to describe it.. Thanks for the recipe. I will give it a go. cheers. hope you had a chance to make it. What a great site, many thanks for sharing. Looks like a middle eastern food banquet this bank holiday weekend for me! Welcome to my blog. Hope you liked the food. All my life I wanted to be a chef. As a true Syrian I ended up a surgeon! Syrian Foodie in London by Kano is licensed under a Creative Commons Attribution-Non-Commercial-No Derivative Works 2.0 UK: England & Wales License.